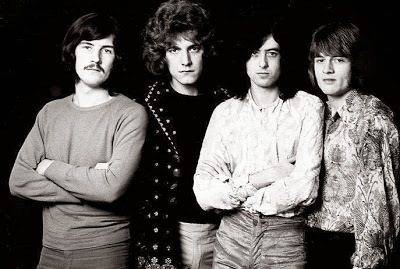 Led Zeppelin have topped the UK Vinyl Singles Chart with their debut Record Store Day release. The band’s limited edition 7” single featuring previously unheard mixes of “Rock And Roll” and “Friends” landed at No. 1 on the chart ahead of tunes by David Bowie, U2 and Jimi Hendrix, among others as issued as part of the April 21 event celebrating the culture of independent record stores. The previously unreleased version of "Rock And Roll" provides an additional peek into the fabled 1971 "Sunset Sound Mixes" of "Led Zeppelin IV". Only two previous "Sunset Sound Mixes" have been released, the first being the version of "When The Levee Breaks" on the original album and the second the "Stairway To Heaven" mix that debuted on the 2014 deluxe edition reissue of the band’s fourth record. In March, Led Zeppelin reissued their 2003 live set “How The West Was Won”; remastered by producer/guitarist Jimmy Page, the collection presents highlights from the group’s 1972 concerts at the Los Angeles Forum and Long Beach Arena, with the two nights sequenced to replicate a single concert from beginning to end.